A handout from Metropolitan Police Shamima Begum who left Britain in 2015. AN UNREPENTANT BRITISH teenager who joined the Islamic State group in Syria has said in an interview that she wants to come home, highlighting the challenge for Western governments on how to deal with returning jihadist supporters. “I just could not endure any more,” she told the newspaper. She added: “I was also frightened that the child I am about to give birth to would die like my other children if I stayed on. Begum said the other two, Sharmeena Begum — no relation — and Amira Abase stayed on in Baghouz, where IS fighters are making their last stand to hold on to the proto-state they declared in 2014. I’m not the same silly little 15-year-old schoolgirl who ran away from Bethnal Green four years ago. And I don’t regret coming here. The British authorities estimate around 900 Britons travelled to Syria and Iraq to join the conflict, of whom around 300-400 have since returned — and 40 have been prosecuted. Speaking to Sky News, Security Minister Ben Wallace said it was “worrying” that Begum had not expressed regret about going to Syria. “It is a challenge for all of us,” he told BBC radio. “Some of them were groomed… when they were young but are now adults and some of them are hardened fighters. A lawyer who represented the families of Begum and her two friends four years ago, Tasnime Akunjee, told The Times he was “thankful she’s alive”. He noted that when they ran away, “there was an understanding that as long as they had committed no further offence they will not be prosecuted and be come to seen as victims”. Begum married a Dutch fighter soon after arriving in Syria. “Mostly it was normal life in Raqqa, every now and then bombing and stuff,” she told The Times. But when I saw my first severed head in a bin it didn’t faze me at all. It was from a captured fighter seized on the battlefield, an enemy of Islam. I thought only of what he would have done to a Muslim woman if he had the chance. Begum said she was nine months pregnant. She said her two previous children had died in the past three months — a daughter, Sarayah, became ill, and a son, Jerah, whose death was linked to malnutrition. “In the end, I just could not endure any more,” she said of her desire to get out. “The caliphate is over,” she said, adding that “there was so much oppression and corruption that I don’t think they deserved victory”. 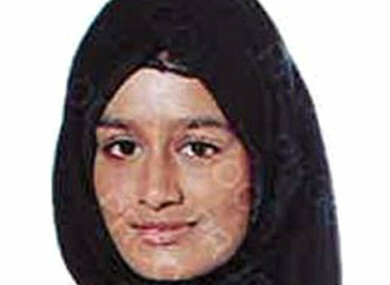 Email “British teen who left London to become ISIS bride wants to 'come home and live quietly'”. Feedback on “British teen who left London to become ISIS bride wants to 'come home and live quietly'”.